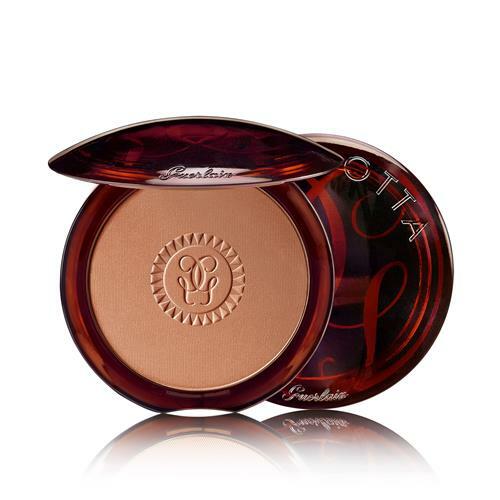 The Terracotta powder by Guerlain is the authority in bronzing powders. It naturally reproduces varying shades of the sun, offering women an instant natural glow, at any time of year, in one quick, easy motion. Its formula, enriched with moisturizing active ingredients, does not dry out the skin. It ensures long-lasting comfort. To be used in all over or to contour and sculpt your tan. Mistake proof. Terracotta is available in eight shades for all skin tones. To give a natural sun-kissed look to the entire face, try the Guerlain secret: trace a "3" on the skin. Apply the bronzing powder with a brush to the raised areas of the face by drawing a figure "3" on each side, from the forehead to the cheekbones, then from the cheekbones to the chin, finishing with a stroke down the neck.